Our flowers delivered to Algeria include only the fresh blooms from the local florist. 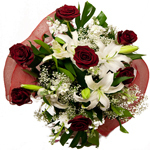 View our Bouquets, Flower Baskets, Flower Compositions and Plants delivered to Algeria. We service the following locations in Algeria: Ain Beida, Algiers, Annaba, Batna, Bechar, Bejaia, Biskra, Blida, Bordj Bou Arreridj, Bou Saada, Chlef, Constantine, Medea, Oran, Ouargla, Setif, Sidi Bel Abbes, Skikda, Tebessa, Tlemcen, and many other towns in Algeria. If your location of interest is not listed - please try our Location Tool or contact us.